My first experience of mainland China was Fuzhou, a smaller city of only 7.5 million people about halfway up the coast towards Shanghai from Hong Kong, English speakers were few but through the marvel of modern technology we managed to communicate. Here, there was a real sense of community and people were very friendly, though it was about as hard to find a bar as it was in the Casinos of Macau. We did eventually manage to stumble upon a “Music Food and Beer Bar” on our last night, where we ate offal and drank warm white ale, the staff changed the music selection on the screens from K Pop to 90’s American, reminiscent of a so fresh CD to make us feel at home. It was clear that everyone in the joint liked to drink as much as we did, and a local guy who was there with his family for Mother’s Day brought us over a couple of cold beers saying “Welcome to China”. It was pretty awesome. Shanghai was something else entirely, the crisp ultra-modern skyline and super-efficient subway system made it feel like a city of the future. At the top of the beer list for Shanghai was Boxing Cat, one of the more highly rated brands in the city with a couple of tap houses. Their beers are very much American inspired with the lineup including IPA, Red Ale, and Pale Ale, but also a Helles and a Pilsner that I suspected of some new world hops. Everything we tried was super fresh and even though I don’t normally throw in for big boozy brews, (because I drink them like water) the Bare Knuckle Barley Wine was hands down the favourite. One of the issues with travelling in China when you only speak English is that its hard to find up to date info even with the internet, for example to confirm that the Toilet Restaurant still exists. By crazy random happen stance, a couple of other Aussies from Fremantle overheard us talking about heading to the Shanghai Brewery and we found out it had moved a suburb over to Denghu Road. Another brewery in name only, this tap house was a bit too “doof doof” for me, but luckily it was only a couple of doors down from the Liquid Laundry, sister venue to Boxing Cat. Dimly lit by low hanging lights and retro lounges, this hip joint had the cool vibe of a speak easy with the open spaces of a sports bar and a little microbrewery just for fun. Easily my favourite venue in Shanghai, boasting a great list of spirits, cocktails and beer, delivered with great professionalism, though for the price I’d much rather sit at my hotel enjoying $2 Tsing Tao and the sweet effervescence of $4 Duvels. On the night of the 2018 Australian International Beer awards, we were on a night train bound for the city of Xi’an. Despite the Great Firewall of China, we were able follow most of the awards as they unfolded over a few drinks, discovering after a fistful of Gold Medals that the Beerland Wheat from Whitfords had won Best Australian Beer of Show! Admittedly, though I wish that it was the NBC Wheat that had championed, I couldn’t have been happier for my friend Tom and proud to be part of the Beerland Team. We trekked all the way from one end of the train to the other to find more beverages and drank a few litres of warm Tsing Tao in celebration of quality beer. When we made it to Xian we found that adjacent to our backpackers, just inside the 14th century city wall, was a place called the Belgian Beer Bar. I was pleasantly surprised to see that they served Chimay Red and Delerium Tremens on tap amongst others, of course we had to savour or rather, throw back a few of these. Belgian beer, proved to be pretty popular in China, readily available from the convenience stores, and despite the clean refreshment of local lagers, you just can’t compete with the magic of Belgian brewing. Beijing was the final destination of my beer journey. We visited Great Leap Brewing which was absolutely packed to rafters, sampling their “Banana” Wheat Beer. We searched for Jing A Brewing in Chaoyang instead finding a German brewpub with a rooftop beer garden and smashing a few good malt driven Lagers. 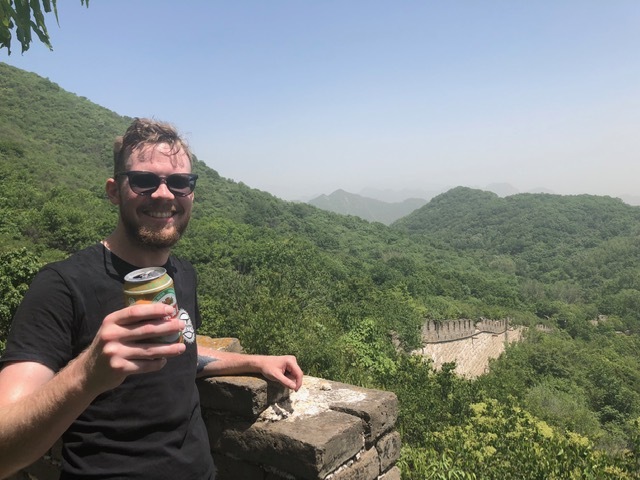 The highlight of Beijing however if not the whole China trip, had to be climbing the Great Wall, past the restorations, and toasting the views with an ice-cold beer. Beerland Brewing has done it again! Beerland Acid Wolf now available!